Appearing like clouds, solar filaments are composed mainly of charged hydrogen gas. Brett Dahl captured this image from McKinney, Texas in August 2012. “Taking solar pictures such as this one requires you and your equipment to be outside in the direct sunlight. I was trying to use an umbrella for shade and also using towels to help keep the direct sunlight off of my camera and computer," said astrophotographer Brett Dahl, who captured the image. "The camera was getting so hot that it would literally burn my fingers when I tried to reposition it." Dahl took the spectacular photo of the sun from McKinney, Texas in August 2012. He used software programs Registax 6 and Photoshop CS5 to process the image. Processing each image took longer than the usual 30 to 45 minutes according to Dahl to bring out the finest details. What looks like a cloud hovering over the air is actually a solar filament composed mainly of charged hydrogen gas. The gas is held in the atmosphere by the sun’s magnetic field which gives it the loop-like structure. 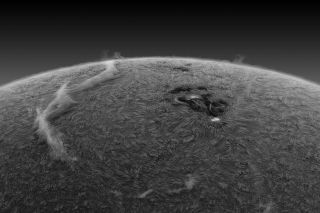 Filaments on the sun can last for a few days or weeks but a longer one like this may remain over the sun’s surface for a month or more. WARNING: Never stare directly at the sun with your naked eye or through unprotected binoculars or a telescope. Severe eye damage or blindness can result. You must always use a proper filter when observing or photographing the sun. Regular sunglasses and photographic polarizing or neutral-density (ND) filters are not safe for use on the sun.